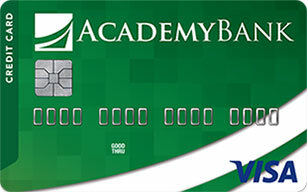 Earn Uber Cash at 1,000+ featured merchants with your Academy Bank Visa. We're proud to be on the KC Business Journal's list for 2018. Make the most of your savings with a special introductory rate of 2.17% APY1. Looking to purchase or refinance a home? Let our Mortgage Loan Experts recommend an option to fit your needs. Get 1.99% APR** intro rate for 6 months with a 5.49% APR variable rate thereafter. Account updates at your fingertips with transaction alerts, low balance alerts, large transaction alerts, and more. Get an Express Loan. It's a great way to access cash you need without breaking your budget, and approval is quick and easy. Need help building or re-establishing your credit? We’ve got just the card. 1 Annual Percentage Yield. 6-month intro rate. $10,000 minimum deposit required.